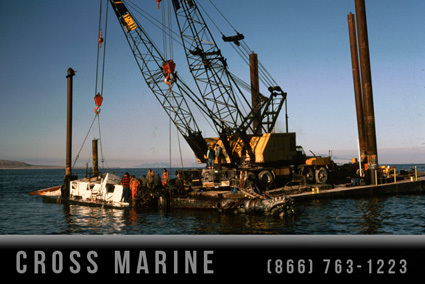 Commercial divers salvaging a sunken hydraulic dredge from a lake after a large storm. 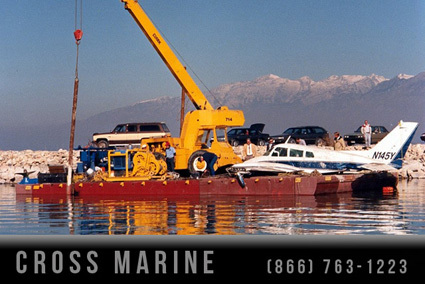 Cross Marine crews transport the wreckage of the airplane in which wrestler, Rulon Gardner, was passenger. 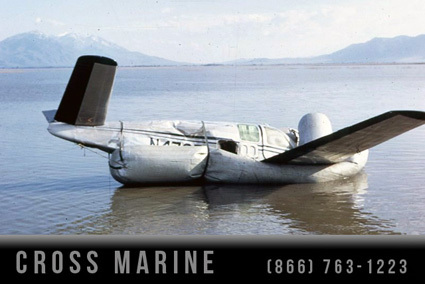 Commercial divers located and salvaged the aircraft in a challenging operation that involved disabling a charged parachute mechanism prior to raising the pane to the surface of the lake. 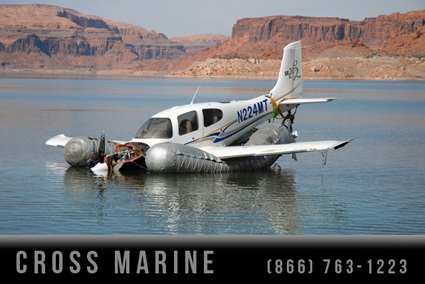 Commercial divers recover a small private airplane that crashed into a lake. The wreckage was recovered carefully helping FAA and the airplane insurance company to determine the cause of the accident. 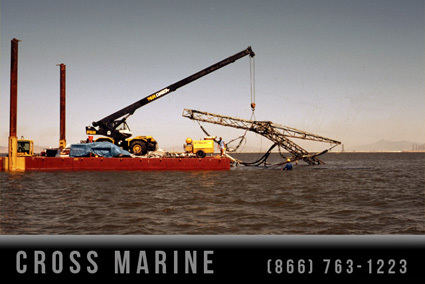 The plane wreckage was transported on Cross Marine’s underwater salvage barge. 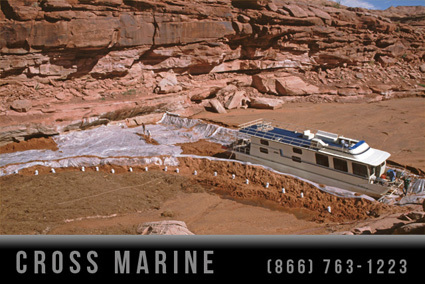 Marine salvage team safely removes a stranded houseboat during a flash flood cleanup project in what was previously a navigable lake tributary canyon. 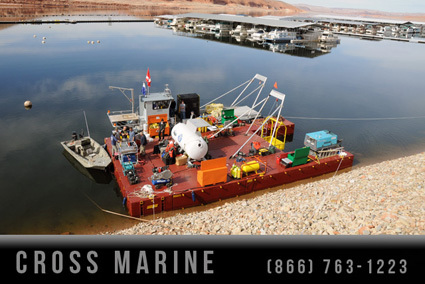 A marine salvage diving barge allows commercial divers to recover several sunken houseboats at deeper depths in high altitude conditions as part of a marina arson fire investigation and cleanup. 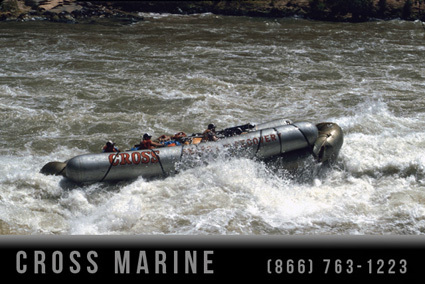 Cross Marine’s crews removed the boat wreckage, including the suspected source of the fire. 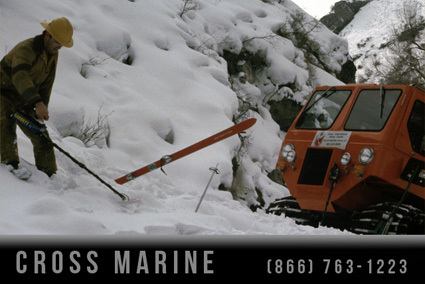 Cross offers many marine salvage diving solutions and specializes in salvage project at remote locations and under hazardous diving conditions. 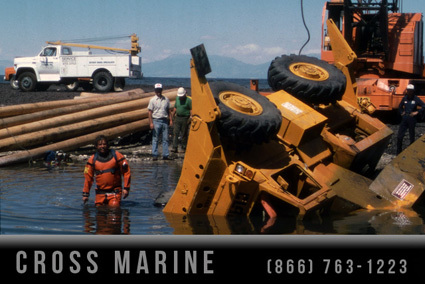 A loader that fell into a lake is recovered by marine salvage commercial divers. 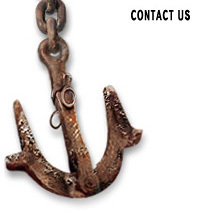 Cross marine offers a variety of commercial diving and marine salvage services.